Memes are for everyone on the Internet, but do they all constitute copyright infringements? This article takes a look at memes and the German quotation and parody exceptions and compares the findings with how the American fair use doctrine applies to memes. Memes are part of the scenery. Many users take it for granted that they can use popular images or video clips or create new ones. They are almost always based on external material such as short film clips, still images or photos. Most users also don’t regard the use of external content for such purposes as illegal and hence don’t consider copyright issues. So, are memes a nightmare for copyright claims on the internet? Or might they even be permissible as exemptions to copyright law? The answer to this question is complicated. Even if memes have become a central part of internet culture in recent years (Zittrain, 2014), there is still no common understanding of what memes actually are and how they can be classified – not even among meme researchers. Memes can perhaps best be described as picture-based internet jokes (Ullrich, 2015). Since there are practically no court judgments about memes, the issue is also legally unclear. When disputes relating to copyright arise, they often don’t go beyond warnings and license claims, which are the precursors to legal disputes. Hence, this article will take a closer look at the possibilities for using photos or film clips for memes without the permission of the rights holders under German and US law. For the use of another person’s photograph to be justified as a quotation, the user must be pursuing an aim to quote (Djordjevic & Passek, 2012). Thus, the external material must, for example, be required in order to support one’s own point of view. This initially seems to be the case for critical memes such as the one shown here. The original photo shows German chancellor Angela Merkel and US President Barack Obama with other summit participants on the fringes of the G7 meeting in Elmau in June 2015. 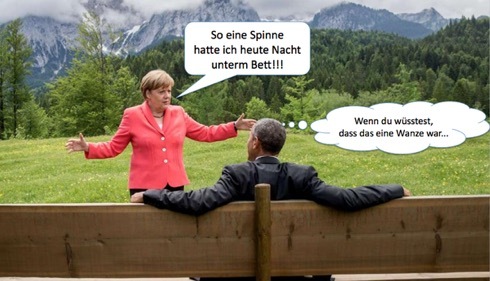 Only the section showing Merkel and Obama talking subsequently spread as a viral phenomenon on the net. The type of meme shown here can be understood as a critical allusion to the revelations about the NSA surveillance and Merkel‘s reaction to it. However, with regard to quotes, courts have already ruled that the external material may only play a minor role in the new post, such as the Federal Court of Justice in the Museumskatalog case (I ZR 32/92) and the Munich Higher Regional Court in the case of Das unlesbare Buch (29 U 1204/12). Photo-based memes do not often meet this requirement, since they usually only add a statement in the form of a title and a subtitle to the images. Hence, the images used cannot be construed as playing a mere supporting role. Artistic freedom allows more – but are memes art? However, the Federal Constitutional Court expanded the limits of the right to quote in its judgement for the Germania 3 case (1 BvR 825/98): If the new contribution is art, artistic freedom permits quotation for a wider range of purposes beyond directly proving something. Then the external material can be used as material to create art and can form the central component of a new artistic statement. In this case, it would not be a problem if the photo constituted the greater part of the new work. But there are difficulties here too: first, a court would have to decide that memes can be considered art and therefore fall within the scope of artistic freedom. Yet do art and memes fall into the same category? From a cultural studies perspective, Wolfgang Ullrich (2016) stresses that whether or not something is seen as art largely depends on the context. As a social media phenomenon, memes often do not fit into an artistic context. Unlike in the case of art works, meme producers show no pride in their work; even in the case of meticulously designed memes, the creators can hardly ever be found. As artistic freedom is a fundamental right, lawyers have developed various concepts of art, which ultimately matter in copyright. In a decision on the right to quote, the Federal Court of Justice (BGH) has defined art as follows: Each artistic work is an interplay of conscious and unconscious processes that can not be resolved rationally. In artistic creation, intuition, imagination and art understanding interact; it is not primarily communication, but expression, and in fact the most direct expression of the artist’s individual personality (I ZR 212/10 – “Blühende Landschaften”). But this definition seems unsuitable for memes, since memes are actually short messages within a community. Whether this narrow definition of the BGH is consistent with the artistic freedom jurisprudence of the Federal Constitutional Court is another question (Schneider, 2012). But even if memes fall under artistic freedom and users are thus allowed to use external material as a central creative element, there would still be problems with the right to quote. First, the prohibition on making changes (Art. 39 and 62, Copyright Act) is still likely to apply, since the images may only be reproduced without alteration, with a few, narrow exceptions. In addition, quotes are required to specify the sources of external material (Art. 63, Copyright Act). However, for the images underlying memes, this is extremely unusual (Ullrich, 2016). Something that becomes an internet meme is typically spread in an uncontrolled manner without proper references to the creator and the material used. These problems alone show that with memes, the right to quote will not get users very far. The idea that memes are permissible under copyright law as parodies could have more potential. If memes can be described as internet jokes, their way of functioning would precisely be “to break or cleverly satirise” the image used as Wolfgang Ullrich (2016) has formulated. Under German law, parodies are permitted as a case of so-called free use (Art. 24, Copyright Act). Since there is also a freedom to create parodies under the EU Copyright Directive, however, the judgements of the Court of Justice of the European Union (CJEU) are also binding in Germany ( I ZR 9/15). In its Deckmyn decision, the CJEU established a wide definition of parodies: According to this, parodies must recall an existing work, and simultaneously exhibit noticeable differences from this and represent an “expression of humour or derision” (C-201/13). At first sight, this might seem to apply to a good many memes. But the CJEU applies one major restriction: It requires a balance between the freedom of expression of the parodist and the rights and other interests of the copyright holder. 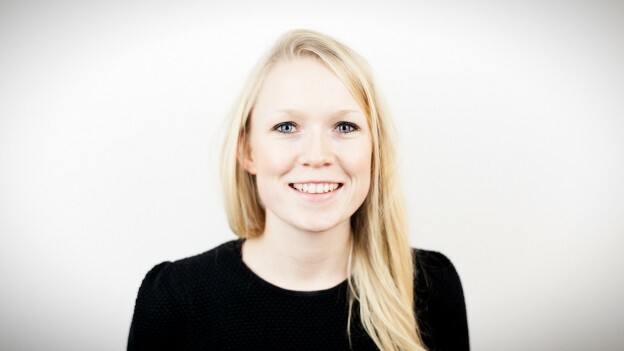 For example, if the new contribution makes a discriminatory statement, the copyright holder has a legitimate interest not to be connected with it afterwards. Thus, ultimately the parody would not be permissible. In memes, humour and discrimination sometimes appear side by side. Consider, for example, the sometimes racist memes based on the image of football player Mario Balotelli (Ullrich, 2015b) in the European Championship semifinals in 2012. However, in a recent decision on a parody of a photo, the BGH provided a limiting explanation that a photographer only has an interest in not being associated with a potentially disparaging statement in a picture parody, if the image manipulation is obscured or is not apparent to the viewer (I ZR 9/15). Everyone realises that memes are not developed by the original creator of the image. So, provided that the creator’s moral rights (in particular Art. 14, Copyright Act) do not prevent it, memes could conceivably be allowed as parodies in many cases. Commentators frequently decry (Kühl, 2012) that the legal situation for memes is so complicated in Europe because Europe lacks a flexible instrument like fair use under US law. It can certainly be argued that memes can be considered fair use when they are used for a different purpose than the original material and, for example, parody it. This is especially true of memes that are created for non-commercial purposes and thus comply with the fair-use principle in another respect. The case ended up before a New York District Court (1:13-cv-07153-ER), which had to decide whether the post – which was perceived by some observers as a political meme – was covered by fair use. The court had to consider whether the use was transformative and thus pursued a different aim than the original or whether it conveyed a modified aesthetic impression. However, a new, transformative purpose could not be identified, since there were only minimal changes to the image itself and its symbolism. The fact that the image was used for advertising purposes for the accompanying TV programme, according to the court, also spoke against fair use. In contrast, several American law professors (Tushnet & Springman, 2015) convincingly claimed that by juxtaposing the image, Fox had re-contextualised it. 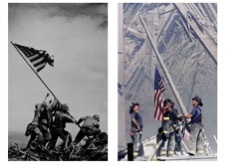 They argued that the broadcaster had revealed parallels in the reactions to 9/11 and Iwo Jima and wanted to demonstrate respect for American heroes. That would be a very different purpose than the original picture, which was more documentary in nature. Before an appeal court could examine the case again, the parties agreed to a settlement. The case shows that where memes and copyright meet, this can lead to disagreement in the United States as well. The complex relationship between copyright and memes is at least in part due to the difficulty of interpreting memes. The cultural studies scholar Limor Shifman (2014, p. 354) writes that memes are mainly about mutation and transformation. She sees the memetic image as a living object. Hence, memes reveal just how many different meanings an image can contain. The variety of possible interpretations leads to legal uncertainty. Different statements can – as the examples show – lead to totally different legal consequences. Hence, if the creator of a meme uses external material, its use cannot be deemed permissible or impermissible under copyright law across the board. Neither the American fair use model nor the German provisions can unproblematically deal with these ambiguities, which are inherent in memes to a much greater extent than in classic works of art. Their constantly changing meanings makes it hard in both jurisdictions to legally classify them across the board and unequivocally. Nevertheless, if memes parody familiar images in a surprising way, one could well argue that they are permissible under US as well as under German copyright law. Thus, in contrast to the meme shown above, one could say: not necessarily copyright infringement, especially if funny. 1:13-cv-07153-ER. N. Jersey Media Grp Inc. v. Fox News Network, LLC, 312 F.R.D. 111, 113, S.D.N.Y.. 10 February 2015. 1 BvR 825/98. Federal Constitutional Court. 29 June 2000. 29 U 1204/12. Munich Higher Regional Court. 14 June 2012. I ZR 212/10. Federal Supreme Court. 30 November 2011. I ZR 32/92. Federal Supreme Court. 30 June 1994. I ZR 9/15. Federal Supreme Court. 28 July 2016. Copyright Act. 94th United States Congress. 19 Octobre 1976. Shifman, L. (2014). The Cultural Logic of Photo-Based Meme Genres. Journal of Visual Culture, 13(3), 340-358. Zittrain, J. (2014). Reflections on Internet Culture. Journal of Visual Culture, 13(3), 388-394. This blogpost was first published on irights.info.